I painted this about a year ago. It now hangs at the end of my bed. But it used to hang in the kitchen of my old house. The house I lost due to long stretches of unemployment. After a two year suckfest, my life was rebooted last fall. I moved into a new place, got a new and better job, a newer car, and started going to a new church. I’ve had my life uprooted and rebooted before, but this time is different. This time I cannot seem to find the rhythm of the new normal. It just doesn’t look like I expected…so I’ve been in a funk. But it has dawned on me this week that I’m trying to be the old me in the new place, and I’m not the same person I was before the last two years of lean life. Two years of alternating unemployment and part time work. Two years of leaning completely on God to provide. Two years of learning that God really doesn’t leave nor forsake you. Two years of my reality being one of my worst cast scenarios, and finding that God really is enough. I could go on, but basically it was two years of living Romans 5:3-5. Jill translation: When everything falls apart…and continues to fall apart…no matter what you do. And you keep asking what did I do wrong and how do I fix it? But you can’t fix it, and you didn’t do anything wrong. It’s just life. And sometimes life is hard. You just gotta put one foot in front of the other. Every. Single. Day. Until you get to the other side. And in that suckfest you begin to find joy in the little things again. Things you forgot about. And you understand there really is strength in joy. What is important becomes clearer. Who is important becomes obvious. You realize God is with you in it and He’s loving you. He’s loving you the same as when your tithe was more in a month than you’re now making a month. And He teaches you that He is and always was your provision. And He proves to you that you can face fear because fear is merely a liar and a bully. You weren’t given a spirit of fear but of power and love and a sound mind. So fear doesn’t actually belong to you like it said it did. So you stop calling it “my fear.” And you begin to realize you really are more than a conqueror, you just didn’t have to conquer anything like this before. And you now know that you can do all things through Christ who strengthens you. I am different now, and stronger, but the best part about this whole deal, or ordeal if you prefer, is that I have a real understanding of hope. Hope isn’t a weak or wimpy wish. Hope is not a frail whisper. 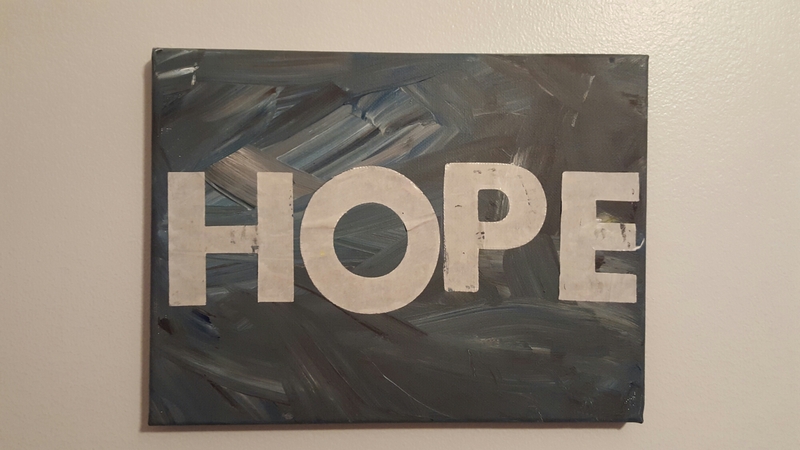 Hope is a battle cry because your hope means that you trust in and rely on and wait for the Lord. For real. You don’t just say it because you think you should. And it’s awesome. And worth it. God didn’t send me the two year suckfest. But He used it to draw me closer and He turned it around for my good. And the good is still being revealed a little bit every day. Bonus point to ponder while you wander…God takes delight in those who hope in and wait on Him. By Jillbeingstill in Being Still, Fear is a Liar on January 28, 2016 .